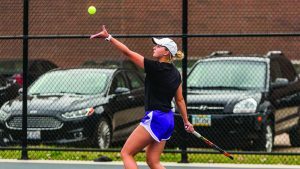 During their final week of their regular season, the women’s tennis team competed in three matches. 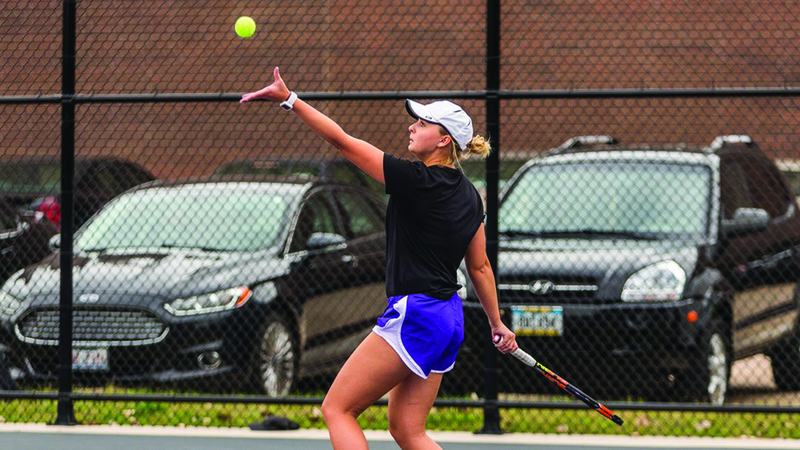 Their first match of the week was against their local rival, the University of Dubuque, which took place at Loras’s courts on Wednesday, Oct. 3. The women showed them no mercy, defeating the Spartans 7-2. For the doubles portion of the match, the No. 1 team of sophomore Audrey Hinz and first-year Noely Bauman, and the No. 3 team of sophomores Meghann Long and sophomore Maddie Smith defeated Dubuque’s No. 1 and No. 3 teams, their matches ending 8-3 and 8-2 respectively. In the singles section, Hinz, Long, senior Emma Cooke, junior McKenna Craff, and Smith claimed wins for the Duhawks in the No. 1, No. 2, No. 3, No. 5, and No. 6 matches. On Saturday, Oct. 6, the women’s team traveled to Storm Lake, Iowa, to take on Buena Vista. Despite being away from home, the women held nothing back, defeating Buena Vista 9-0. In doubles, Hinz and Bauman defeated their No. 1 team 8-1, and sophomore Franny Roche and Smith defeated the No. 2 team 8-1. The Duhawks claimed an automatic win for No. 3 doubles due to Buena Vista only having five players. In singles, Hinz, Long, Cooke, Craff, and Smith all soundly beat their opponents with the majority of their sets ending 6-0, with only two of them ending 6-1. With this third conference win under their belt, the women’s tennis team claimed their spot in the conference tournament in the spring. Junior McKenna Craff serves during a singles match. The Duhawks were not kind to their host Saturday when they swept Buena Vista, 9-0, in Storm Lake, Iowa. Their final match of their regular season was against Nebraska Wesleyan, and took place on Sunday, Oct. 7 at Lincoln, Nebraska. The women ended their season on a high note, defeating Nebraska Wesleyan 8-1. In the doubles section, the No. 1 team of Hinz and Bauman once again defeat their opponent, their match ending 8-2. The No. 2 team of Cooke and Roche also claimed a win, the final score of their match being 8-5. Long and Smith, playing as the No. 3 team, lost their close match, the final score being 8-5. For the singles matches, Hinz, Long, Cooke, Bauman, Craff, and Smith all claimed wins for the Duhawks. Once again, they took care of business, making sure to end their regular season right. Cooke, the senior of the team, ended her final fall regular season with a career record of 55-19, which is the second all-time highest record in program history. After the match against Nebraska Wesleyan, the women’s overall score was brought to 6-6, with their overall conference score ending 4-4. All that’s left for the women this season is the American Rivers Conference Individual Tournament, in Ankeny, Iowa, on Friday, Oct. 12, and Saturday, Oct. 13. With the wins that the women’s tennis team claimed last week, they will be going into the conference tournament as the fifth seed. There, they will be competing against some of the conference’s best teams, such as Coe and Luther. These opponents will be tough, but that won’t stop the women from playing their best. Let’s show the women’s tennis team the support they deserve, as they work towards their goal of winning the conference tournament in the spring.